The pleasant and Stately Morall, of the three Lordes and three Ladies of London. With the great Ioy and Pompe, Solempnized at their Mariages: Commically interlaced with much honest Mirth, for pleasure and recreation, among many Morall obseruations and other important matters of due Regard. LONDON. Printed by R. Ihones, at the Rose and Crowne neere Holburne Bridge. 1590. 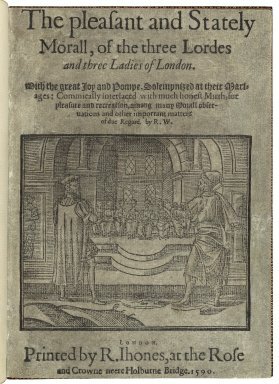 Title page imaged from Folger call number: STC 25783 copy 1. Image is not from the transcribed copy.